The Honey Maple line offers a natural maple color that is timeless. With its square raised panel doors and concealed Euro-style hinges the Honey Maple will add a warm and inviting touch to your kitchen. I want to stay many thank you's! for being available for reasonable priced quality kitchen cabinets! With your cabinets and under cabinet Led Lighting helped in featuring this highly architectural design features come to life, within 1 week! The versatility of these cabinet, facias, crown mouldings, produced designs of "Poped out and Poped up" upper cabinets to feature the kitchen sink and stove. I had used other architectural wood elements, such as the appliques and corner peninsula carved legs, along with a concealed flush touch latch door at the wainscot front to complete the design intent. All in all this truly classical kitchen design cost a total of materials supplied at $3,750. The cabinets were good... I think the quality of the cabinet is a step up certainly from what you get at Home Depot off the floor. Peg W.
Viewing Tip: To see a close up of each Honey Maple RTA cabinet, click on the description of the individual items on the order pages. Note: Rollout trays do not work with this cabinet. 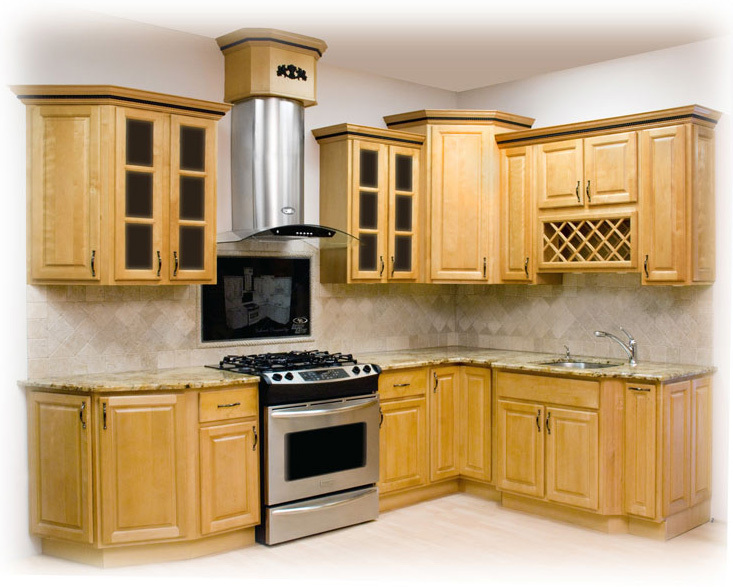 The Honey Maple Kitchen Cabinet Series are a timeless classic with a natural maple color and square, raised panel doors. We love the versatility of the natural wood, as it can complement any kitchen design - from a more formal, traditional kitchen to modern and contemporary, along with everything in between! The Honey Maple Series can handle any color or finish for appliances, stainless, black or white. If you have a mixed set of appliances, as many do, the Honey Maple Series can handle it well. Countertops will also have a range of choices for the Honey Maple kitchen cabinets. From granite to tile to engineered surfaces, the Honey Maple Series can handle the look. • Rich, deep colors will contrast with the natural Maple wood of the Honey Maple Series, giving a dramatic effect. • Solid colors of stone offer a seamless, elegant style - black is always in style and a black granite countertop is a contemporary look that any kitchen can handle with grace. For a less bold attempt to use black in the kitchen, try some sleek black kitchen accessories or a black kitchen island or chairs. • Smaller kitchens can go formal as well with the Honey Maple Series, the light, natural stain helps open up the room and allows you to take on design elements in smaller spaces that darker cabinets could not handle, such as a rich sage color palette. • A glass mosaic backsplash using small glass tiles in complementary colors adds an air of casual sophistication. • A lighter, softer color palette offers a more casual, inviting atmosphere to the kitchen. • Unusual color palettes, such as blues - which are not normally found in kitchens - are a fun twist that the Honey Maple Series can handle well. • Add touches of texture to warm up all of the smooth surfaces and straight lines in the kitchen. A window valance, a seat cushion or even kitchen towels in a warm pattern tend to lend a sense of familiarity in a room. The natural, light Maple finish allows you to focus on the quality of the Honey Maple series, since there are no particle board pieces in any RTA kitchen cabinet. Our door stiles, rails and face frames are of solid, hardwood Maple while the sides are made of plywood. Concealed Euro-hinges keep the focus on the cabinetry. Each drawer box is solid wood with the back and sides of the drawer stained to match the color of the cabinets. The concealed side mount drawer slides make opening and closing the drawers a smooth move. RTA Cabinets stand for Ready-to Assemble, and we mean it - a screwdriver is all it takes to assemble our cabinets. Each cabinet is shipped in its own box for safe shipping and arrival. The Honey Maple Series of cabinetry is versatile, handsome and oh-so natural. For a timeless classic in cabinetry that will grace your kitchen for years to come, consider the Honey Maple Series for your kitchen.